Introducing the Nica Puro Rosado premium cigar line by Alec Bradley. These hand-rolled cigars are infused with double binders and long-leaf fillers from the three Nicaraguan growing regions of Esteli, Jalapa, and Condega, and feature a golden Rosado Coloardo wrapper from Nicaragua. The double binders in each Nica Puro Rosado premium cigar creates a slow burning medium to full flavored smoking experience offering flavored notes of nuts, chocolate, leather, and spice upon each inhale. 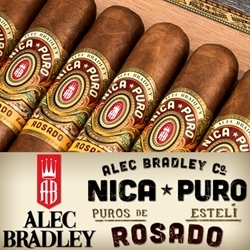 Alec Bradley Nica Puro Rosado cigars will make an excellent addition to your cigar humidor. Stock up today! Smokers Discounts believes you'll love Alec Bradley Nica Puro Rosado premium cigars. We’ve made it easy and affordable to buy these hand-rolled cigars online. A variety of sizes and flavors are listed below in our online cigar store. Each of these styles are in stock and available today for a low discount price. Call us for more details!